ON MAY 29, 2003, Mike Lee sat atop Chili, a nearly 1,700-pound (772-kilogram) bull at the Professional Rodeo Cowboys Association’s rodeo in Fort Smith, Arkansas. Lee, just 20 years old, was tense, shaking his neck, and taking deep breaths. His left hand clutched the “bull rope” bound behind the beast’s front legs. Chili heaved and snorted and tried to maneuver his body in the tight-fitted, gated steel chute. Surrounding Lee in the arena, the crowd roared, awaiting what some sports commentators consider the most dangerous eight seconds in sports. The last thing Lee remembers was the chute opening. After six seconds, the bull threw Lee, causing their heads to collide. The smashing of skulls left a hole in Lee’s memory that has yet to be filled. “I fell off the bull, crashed into the ground, and ran away, my mom tells me,” Lee said. “There was blood gushing from the right side of my skull, but I only remember waking up in the hospital.” The injury kept him out of competition for four months while he recovered from brain surgery. Just last week, on February 13 and 14, Lee placed fifth at the Anaheim Open professional bull-riding event in California. The placement catapulted Lee into the top tier of bull riding; he now ranks second worldwide on the 2003-2004 professional bull riders major-league circuit, called the Built Ford Tough Series. Professional bull riding has skyrocketed in popularity in the last ten years. In the early 1990s, bull riding was still a small, obscure, extreme sport. But the 15-fold increase in yearly professional prize money—from U.S. $650,000 to almost 10 million dollars on the Professional Bull Riders tour—and regular national television coverage have raised the profile of bull riding and brought the sport to the masses. NBC Sports covered the Anaheim Open professional bull-riding event, and over a hundred million people are expected to watch televised bull-riding events worldwide in 2004. Part of the thrill comes from watching professional bull riders match their riding skills, intuition, and courage against animals 15 times their weight. Not surprisingly, riders suffer injuries every year. Riders, like Lee, often compete again long before they are fully healed. Pro bull riders are compelled to compete for many reasons. Bull riding has evolved into an important spectator sport, with fan clubs, Web sites, and groupies who follow parts of the tour. While not quite celebrities, top bull riders sign autographs, give luncheon speeches, and do public announcements for charities. But it’s not only the riders who are famous. “There’s this one bull, maybe the most famous bull that’s ever been—Little Yellow Jacket out of North Dakota. He was voted best bucking bull in 2002 and 2003 by the best riders on the tour. 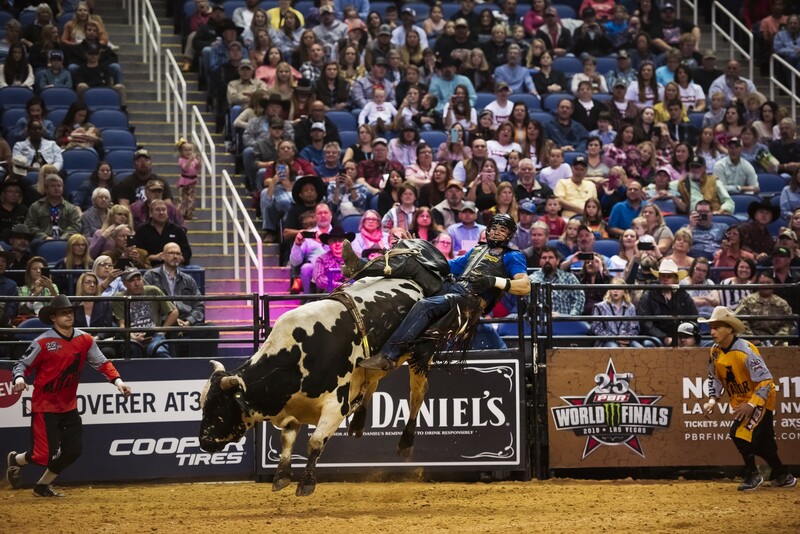 No bull has ever won that title two years in a row,” Hedeman said. Other bulls have also become legendary, like Canada’s Calgary stampede bull Outlaw, which weighs 2,100 pounds (995 kilograms) and has horns 2.5 feet (76 centimeters) wide. He was ridden unsuccessfully 57 times until pro rider Justin Volz, from Charlie Lake, British Columbia, hung on for the required eight seconds in 2003 before getting off safely. The goal of professional bull riders is to hold onto the bull with one hand for eight seconds. Some competitions feature several rides per day by the same rider on different bulls. Depending on the contest, up to four judges dish out a score for a rider based on his ability to ride a bull and on the bull’s bucking performance. A perfect score is 100 points. Most professional riders score between the mid-70s and high 80s. The largest wild card is always the bull. The U.S. professional rodeo circuit averages one or two deaths annually. Several more riders suffer serious spinal or brain injuries each year, according to the World Health Organization’s Helmet Initiative. It is coordinated by the Center for Injury Control at the Rollins School of Public Health at Emory University in Atlanta, Georgia. Professional riders choose whether to wear helmets or not. Lee wore a helmet when he banged heads with Chili and thinks it may have saved his life. This year Professional Bull Riders, Inc., is sponsoring more than a hundred competitions attracting at least 800 riders. Events are scattered across the U.S., Brazil, Canada, and Australia. Professional bull riding is growing into an international sport, with Russia, Sweden, and Japan all holding events as well.